| colspan="2" style="text-align:left;" | Content - news items, etc. 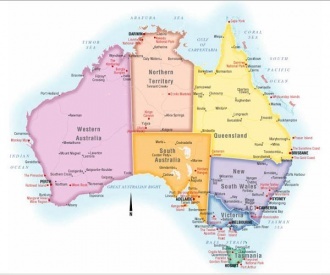 Australia is both a continent and the world's largest island, with a landmass of 7,617,930 km<sup>2</sup> (2,941,300 mi<sup>2</sup>). Surrounded by the [[Indian Ocean|Indian]] and [[South Pacific|Pacific]] oceans, Australia is separated from Asia by the Arafura and Timor seas. 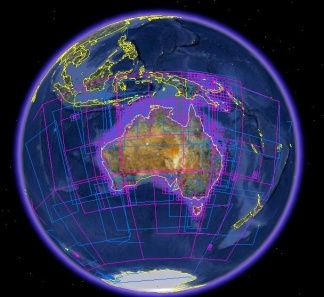 Australia has 34,218 km (21,262 mi) of coastline (excluding all offshore islands) and claims an extensive exclusive economic zone of 8,148,250 km<sup>2</sup> (3,146,060 mi<sup>2</sup>) including some areas of the north-west continental shelf disputed by Indonesia. This exclusive economic zone does not include the Australian Antarctic Territory. The [[Great Barrier Reef]], the world's largest coral reef, lies a short distance off the north-east coast and extends for over 2,000 km (1,240 mi). Mount Augustus, claimed to be the world's largest monolith, is located in [[Western Australia]]. At 2,228 m (7,310 ft), Mount Kosciuszko on the Great Dividing Range is the highest mountain on the Australian mainland, although Mawson Peak on the remote Australian territory of Heard Island is taller at 2,745 m (9,006 ft).